Crouch was commissioned in April 1892 in the 2nd Infantry Battalion. From July 1903 he was a captain in the 6th Australian Infantry Regiment and commanded the Prahran Infantry Militia. He approved of the Australian National Defence League which advocated compulsory military service, and while overseas in 1911-12 contributed an important article on national service to the official British Army Review (1912). Crouch was promoted major in 1908 and in July 1912 commanded the 56th Infantry Battalion (Yarra Borderers). Promoted lieutenant-colonel in February 1913, on 16th March 1915 he was given command of the 22nd Battalion, Australian Imperial Force. Under his command the battalion landed at Gallipoli on 5th September 1915 but early in December Crouch was transferred to command the Base Camp at Mudros on the island of Lemnos. He was compelled by illness to return to Australia in March 1916 and on 13th April his AIF appointment was terminated. Crouch, whose support for national service had stopped short of advocacy of compulsory overseas service, now set his mind to opposing conscription. As Victorian branch president of the Returned Soldiers’ No-Conscription League he worked against W. M. Hughes during the referenda campaigns of 1916 and 1917. He joined the Labour Party and in 1924 was chosen to represent Australia at the International Federation of Trade Unions Education Conference in Oxford. On his return he became an active leader of the Labour movement in Victoria. Norris was a soldier in the Commonwealth Military District Orders as a member of the Irish Rifles and in 1912 was promoted to the rank of major with the 34th Regiment Commonwealth Forces. After sailing for the war, Norris was appointed to command the 6th Infantry Training Battalion, AIF, at Heliopolis in Egypt. His capacity for organisation and control found responsibility gravitating towards him and in due course, he was promoted to Lieutenant-Colonel, and to command the 22nd Battalion. He was commanding officer for only a brief period from 1st to 26th February 1916, whereupon he was transferred to command the 53rd Battalion within the newly formed 5th Division. The Battalion received theatre honours in Egypt in 1916 for the defence of the Suez Canal against the Turks although they did not take part in any of the fighting. In June 1916, Norris left Egypt and arrived in France with the 53rd Battalion. Within a very short period of time, the 53rd Battalion was engaged in the disastrous Fromelles offensive in northern France, the battle simply a diversionary tactic for the Somme offensive happening some 50 miles to the south. On the 19th/20th July the Australians suffered 5,533 casualties for no gain. Norris, in his first action, was killed while leading men of his Battalion in an assault on the second enemy line in front of the village. According to reports he was hit several times by machine gun fire and died fairly instantly. Norris’s body was not recovered, though his name appeared on a German list of 1919 confirming his death. However in 2008 following historical research and analysis of aerial photographs a mass grave was identified at Pheasant Wood on the outskirts of Fromelles. The Fromelles Project commenced with excavation of the Pheasant Wood site and the presence of the bodies was confirmed, with the bodies recovered the following year. A specially convened Identification Board published a report on 17th March 2010 announcing the first 75 bodies to have been successfully identified using DNA analysis. Further identification continued and as of 2014 144 had been positively identified. Lieutenant Colonel Norris is one of these men, and indeed was one of the first to be identified in 2010. 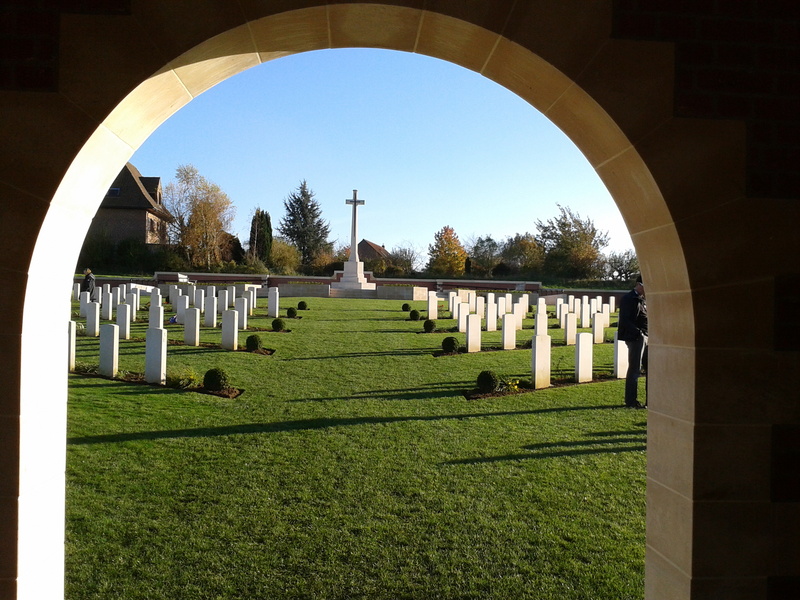 A new cemetery was constructed by the Commonwealth War Graves Commission to house the bodies, and was opened and dedicated in 2010. The dead soldiers were reburied with full military honours in a series of funeral services. Smith’s militia service began with three years as a private with the Victorian Scottish Regiment. In 1910 he was commissioned in the 5th Australian Infantry Regiment, in April 1913 was promoted captain in the 60th Regiment and in August 1914 major. On 24th March 1915 he joined the Australian Imperial Force and was appointed second-in-command of the 22nd Battalion which was being formed. The 22nd Battalion sailed from Melbourne on 3rd May 1915 on the Ulysses for Egypt. On 5th September the 22nd landed at Gallipoli. From its arrival until the evacuation, the battalion held trenches at Johnston’s Jolly and Lone Pine. For a period during November-December Smith had temporary command of the battalion, which was one of the last to leave Anzac on 20th December. Smith was promoted lieutenant-colonel, with command of the 22nd, on 24th February 1916. The battalion arrived in France in March and in July moved to the Somme, where it fought at Pozieres and Mouquet Farm. The dreadful Pozieres fighting was the most costly experienced by the 22nd during the war, the battalion suffering nearly 800 casualties. Smith was awarded the Distinguished Service Order for his command of the battalion since March and especially his determination, energy and planning during the unit’s assault on the Old German trenches at Pozieres on 4-5th August. In November the 22nd experienced the beginning of the Somme winter in ‘the mud and wretchedness of Flers’. During late November and December Smith temporarily commanded the 6th Brigade. On 1st January 1917 he was promoted colonel and temporary brigadier general, with command of the 5th Brigade. In April the Germans attacked the Australian line at Lagnicourt. Smith, whose headquarters was about 400 yards from the fighting, personally directed under fire a spirited counter-attack; his battalions pushed the Germans back for more than two miles and took over 250 prisoners. He was awarded a Bar to his DSO. Only a month later, however, his brigade fought poorly during the 2nd battle of Bullecourt, and Smith did not escape criticism for his part in the battle. The Australians then moved to Flanders in preparation for the 3rd battle of Ypres. On 20th September the 5th brigade helped to drive the German line back during the battle of the Menin Road; it was involved in the Broodseinde Ridge operation of 4th October and on 9th October took part in the costly Passchendaele fighting. The last of the 5th Brigade’s operations to be commanded by Smith were those at Hangard Wood between 7th and 19th April 1918, in which the brigade fought with great spirit. Smith was evacuated sick on 3rd May and in August, shortly after his award of a Belgian Croix de Guerre had been gazetted, he embarked for Australia. He had been mentioned in dispatches four times. After the war Smith commanded various militia brigades and in 1926 was appointed aide-de-camp to the governor-general, Lord Stonehaven. Smith became president of the Geelong branch of the Returned Sailors’ and Soldiers’ Imperial League of Australia. Davis entered the military in 1898 and qualified as a 2nd Lieutenant. He then had a number of officer commanding posts including D Company Tasmanian Rangers, and Tasmanian Cadet Brigade. Prior to the war Davis had civil employment as inspector of schools. Upon enlisting for the AIF Davis was appointed major in the 26th Battalion and on 23rd June 1915 was appointed commanding officer of C Company of the Battalion. In May 1916 he was appointed commanding officer of the Cycling Battalion, 1st Anzac Corps. In July he was appointed as commanding officer of the 2nd Anzac Entrenching Battalion before re-joining the 26th Battalion on 13th August. On the 14th November 1916 he was evacuated to England having been wounded in the thigh at Gueudecourt during the latter stages of the 1916 Somme offensive. Upon his return to the front he was appointed Lieutenant Colonel and took command of the 22nd Battalion on 23rd February 1917. In May of that year he left the Battalion and France and headed for England where he assumed command of the 6th Training Battalion for the rest of 1917. His personal situation of age and health, meant that he was becoming less effective and, on his own request, Norris returned to Australia on 31st January 1918. His death in 1931 was said to be have been as a result of his war service years. Before the war Wiltshire served three years in the senior cadets, then joined the militia and in 1913 and was commissioned in the 56th Infantry (Yarra Borderers). Wiltshire was promoted lieutenant in February 1915, and transferred next month to the 22nd Battalion, Australian Imperial Force. Wiltshire was promoted captain in May and, on reaching Gallipoli in August, was appointed unit adjutant. In the evacuation of the peninsula in December he had charge of the battalion’s last party. He remained adjutant until April 1916 when he was given command of a company in France. Placed in charge of training a 200-strong brigade raiding-party, he had overall command of an attack on German lines at Armentieres on the night of 29-30th June for which he was complimented in Army Corps orders. While in charge of ‘C’ Company at Pozieres, he was wounded on 27th July. During his convalescence recommendations went forward citing his good work in commanding his company and his personal gallantry in reconnaissance; he was awarded the Military Cross. Returning to his unit, he was promoted major in October and made second-in-command; between October 1916 and February 1917 he temporarily commanded the battalion. At the 2nd battle of Bullecourt in May 1917 Major General John Gellibrand who regarded Wiltshire as ‘a specially trusted assistant’ employed him on crucial liaison duties with a British division on the left of the 6th Australian Brigade. On 10th June Wiltshire was promoted lieutenant-colonel and appointed to command the 22nd Battalion; aged 26, he was one of the youngest Australian battalion commanders. He was ‘cool and resolute in a crisis; a careful planner who was prepared to push his men, ruthlessly if necessary, to reach his objectives’. For his work at Broodseinde, Belgium, in October he was awarded the Distinguished Service Order. He took temporary command of the 6th Brigade for several short periods in 1918; he was thrice mentioned in dispatches and appointed CMG. His AIF appointment ended in November 1919. Upon his return from the war Wiltshire resumed work with the Bank of Australasia. Meanwhile, he also continued his militia career: in 1920-21 he was temporary commanding officer of the 2nd Battalion, 22nd Infantry Regiment; in 1921-24 he commanded the 8th Battalion and in 1924-28 the 24th.